Construction of the US$304M, 5.7km long maze of 11 tunnels for the US$1.4bn European X-Ray Free-Electron Laser project (European XFEL) in Germany has been completed. 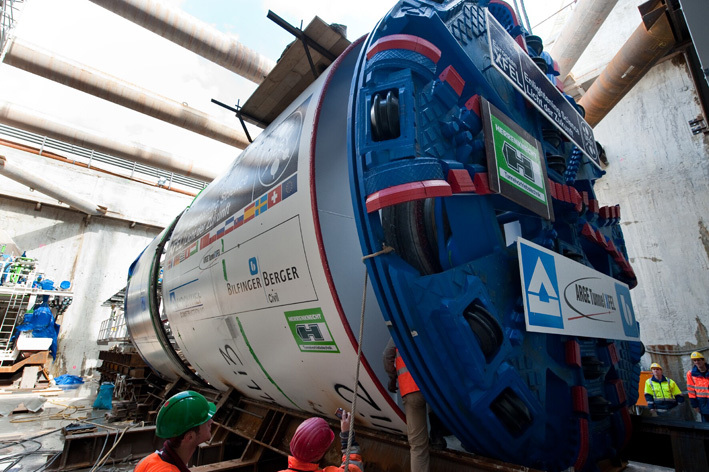 The complex network of tunnels between Hamburg-Bahrenfeld and Schenefeld in Schleswig-Holstein were built by the ARGE Tunnel XFEL JV comprising Hochtief and Bilfinger Berger using two Herrenknecht Mixshields, of 6.17m and 5.45m diameter erecting a segmental lining through boulder clay, sands and gravel. Tunnel construction began in July 2010 with the 6.17m diameter Mixshield ‘TULA’ which bored the first three drives, XDT 1 (480m), XDT 2 (549m) and XDL (2010m). Tunnelling with TULA was concluded in August last year. In January 2011, the 5.45m diameter second machine, AMELI started excavation of an array of short drives, XTD 9 (544m), XTD 10 (220m), XTD 4 (300m), XTD 8 (361m), XTD 7 (141m), XTD 5 (200m), XTD 3 (267m) and XTD 6 (660m). Tunnelling was logistically complex given the special layout of the project, the 160 tonne machine had to be repeatedly relocated and re-prepared for boring. Tunnelling was officially concluded on June 14th. The European XFEL, which is due to open in 2015, will generate ultrashort X-ray flashes – 27 000 times per second and with a brilliance that is a billion times higher than that of the best conventional X-ray radiation sources. The facility will open up completely new research opportunities for scientists and industrial users.